Is the AIIB living up to its green claims? The world is now united under a single existential threat. We have 12 years left to stop the catastrophic break-down of our climate. This is an extraordinary opportunity for collective action. We have to nearly halve our total greenhouse gas emissions to stop the global average temperature from exceeding 1.5°C. Bank Information Center Europe is campaigning to shift international financial flows away from from dirty fossil fuels: a vital part of the solution in the next few years. As part of this, we follow the money?—?specifically into the publicly-funded multilateral development banks (MDBs). There, we have found billions of dollars worth of our money continuing to prop up the fossil fuel industry. The Asian Infrastructure Investment Bank (AIIB) is the world’s first post-Paris Climate Agreement MDB. It began work just a month after the climate pact was agreed in December 2015. Calling itself a ‘lean, green and clean’ institution, the AIIB is in a strong position to forge a new path and live up to its commitments towards the Paris Agreement on Climate Change, the 2030 Agenda for Sustainable Development and the principle underpinning Sustainable Energy for All (SEforALL), as outlined in its Energy Sector Strategy (ESS). But the ESS has big loopholes and many have expressed concern that it failed to rule out AIIB supporting coal and for laying such heavy emphasis on harmful gas and large hydro dams. To date, the AIIB has funded several fossil fuel projects, including the Trans-Anatolian gas pipeline, the Bhola IPP gas power plant in Bangladesh and the Myingyan gas power project in Myanmar. At the AIIB’s 2017 Annual General Meeting in Korea, civil society welcomed bank President Jin’s comments that “there are no coal projects in our pipeline, and we will not consider any proposals if we are concerned about their environmental and reputational impact”. Despite this ambition, worryingly the AIIB has also taken its first step into coal. Through its investment in the IFC Emerging Asia Fund (EAF), the AIIB is indirectly financing increased use of coal, including the expansion of a coal mine, by the Shwe Taung Cement group in Myanmar. The STC example shows how investing through third parties, like infrastructure funds, can result in the AIIB funding coal and other harmful fossil fuels by the back door. Today BIC Europe and the Big Shift Coalition are releasing a new analysis of the AIIB’s portfolio to date. The results are disappointing. 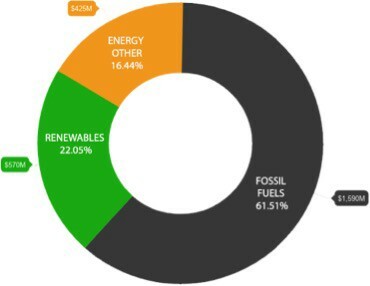 After nearly three years of operation, and having approved over US$6 billion in investments, over a quarter of its entire lending portfolio has backed fossil fuels. By comparison, it has only invested just over 9% into renewables?—?and even that mostly into large-scale projects. Weighing up the AIIB’s investments in the energy sector alone is similarly worrying. 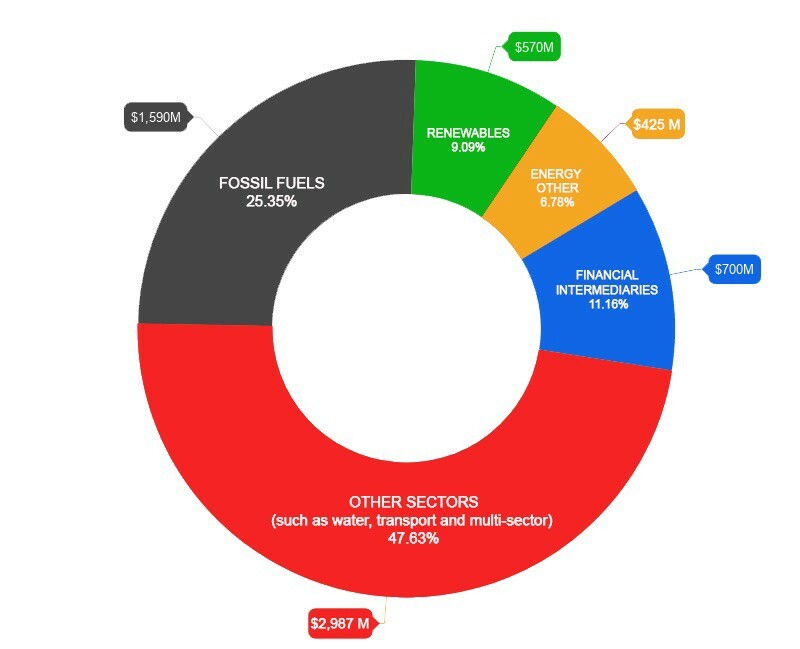 The bank has invested a staggering 61% into fossil fuels against only 22% for renewables. And this figure does not even include the AIIB’s indirect or “hands off” investments through financial intermediaries (FIs), which currently make up over 11 per cent of its total lending portfolio. It is often unclear with this form of lending where the money ends up. However, from BIC Europe’s analysis, it is certain that some of the sub-projects the AIIB backs through FIs also involve fossil fuels. The AIIB is contradicting its own commitment to help countries move to a low-carbon path. Instead of helping Bangladesh to scale up renewable energy, for example, almost half of the AIIB’s total direct investments in this climate-vulnerable country support fossil fuels, including a direct investment in a new greenfield gas power plant. In its FI lending through the EAF, the AIIB is also exposed to Summit Power International. This is the largest independent power producer in Bangladesh, which currently owns and operates 15 power plants in the country. To date, all of its power plants are run on heavy fuel oil or liquefied natural gas, with no renewable energy projects in operation nor in the list of planned projects listed on the company’s website. The AIIB is not living up to its green promises. To help governments make the big shift necessary to avert runaway global warming, the AIIB should immediately clean up its lending. It should stop investing in coal mines and coal power. It needs to match the World Bank’s commitment to end upstream financing for oil and gas extraction. It must plan to phase out investment in fossil fuels by 2020. Importantly too, the AIIB should require its FI clients to track and disclose any fossil fuel investments and only back those clients that commit to develop a portfolio decarbonisation plan within a year of investment. BIC Europe will continue to monitor the AIIB’s portfolio on a quarterly basis to track whether it is moving in the right direction.